*FOR COVER LETTER TIPS CLICK HERE. This summer writing program introduces rising high school sophomores, juniors and seniors to many different genres, including poetry, short fiction, creative non-fiction and drama. Students read and discuss the work of established authors and participate in writing-intensive exercises and workshop sessions led by Alfred University faculty members. Campers stay in university housing and enjoy a variety of recreational activities outside of classes and workshops, such as movie nights, games, and social gatherings. The program runs for five days at the end of June. Learn more. The Young Writer’s Workshop is a 3-week program for high school students. Unlike conventional workshops in expository and creative writing, Simon’s Rock’s focuses on using informal, playful, expressive writing as a way to strengthen skills of language and thinking. Out of these informal writing activities, using techniques of peer response, students develop more polished pieces, ranging from personal narratives to stories, poems, and exploratory essays. The Champlain College Young Writers’ Conference (CCYWC), a residential writers’ weekend specifically for high school students, takes place this May 25 – 27 on the hillside campus of Burlington’s Champlain College. For dedicated young writers, it is a chance to meet others who share their passion for telling the stories of their lives. It is also an opportunity to study the craft of writing with some of New England’s most celebrated authors and teachers. Emerson’s Creative Writers Workshop is a five-week program for rising high school sophomores, juniors and seniors to develop their writing skills in a variety of media, including fiction, poetry, screenwriting, graphic novels and magazine writing. Participants attend college-level writing classes exploring these genres and write and present their own work, creating a final portfolio of their writing, contributing to the workshop’s anthology and presenting a reading for family and friends. On-campus housing for the duration of the workshop is available. Learn more. Georgetown’s residential Creative Writing Institute offers rising high school sophomores, juniors and seniors the opportunity to experience a variety of genres of writing and learn how to publish their own work. The eight-day session covers topics including literary history, writing technique and do-it-yourself publishing. Students participate in workshops, attend readings, experience Washington, D.C.’s literary culture, and take part in peer review sessions to fine-tune their writing skills. Learn more. The Juniper Institute for Young Writers is an extraordinary nine-day creative writing program for students who are finishing their sophomore, junior, or senior years of high school. Hosted by the University of Massachusetts MFA Program for Poets and Writers, the Institute offers participants a unique opportunity: intensive workshops in fiction and poetry, craft sessions and studio courses designed especially for young writers, as well as unparalleled exposure to world-renowned authors through readings and Q&As with its companion program for adults. The Iowa Young Writers’ Studio is a summer creative writing program for high school students at The University of Iowa. Students in the program build a community of peers while working with experienced writing teachers, primarily students and graduates of the University’s M.F.A. program in creative writing. Young writers who have completed grade 10, 11, or 12 are eligible to attend the studio. 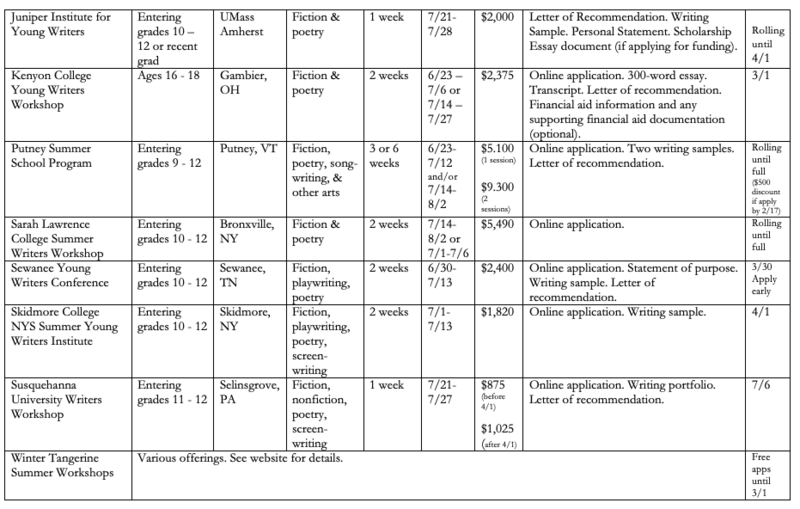 Application materials include an application form, a creative writing sample, a statement of purpose, a high school transcript, and a letter of recommendation from an English teacher or another instructor familiar with the applicant’s writing. Session 1: late June; Session 2: Session 2: mid-July. The Iowa Young Writers’ Studio offers online courses for high school students independently of the summer residential program in creative writing, fiction writing and poetry writing. All courses will be taught by graduates of the Iowa Writers’ Workshop. The courses will run for six weeks, from mid-January through February. The online courses will require approximately three hours of engagement per week, which will include writing assignments, reading assigned materials, critiquing classmates’ writing, and participating in online discussions. The courses are asynchronous, meaning that students can complete the weekly assignments and post in the discussion forums on their own schedule in their free time. Students who complete the course and meet all requirements will receive one college credit from the University of Iowa. Deadline: Early November for January/February session. Mid-April for Summer Session. Kenyon College Young Writers Workshop is a 2-week program for 16 – 18 year old intellectually curious, motivated high school students who value writing. Our goal is to help students develop their creative and critical abilities with language—to become better, more productive writers and more insightful thinkers. For more than nineteen years, Young Writers has provided a lively, supportive environment where students can stretch their talents, discover new strengths, and challenge themselves in the company of peers who share their interests. The New England Young Writers’ Conference (NEYWC) at Bread Loaf is a four day writing-focused workshop for high school students in New England and from around the country. The long weekend is packed with writing seminars, workshops, readings, and opportunities to meet fellow young writers. High School English teachers or guidance counselors may nominate up to 5 students from their school to participate in the conference. Up to two may be selected. Please click here for more information on nominating your students. Applications will be accepted from Oct 10 – Nov 30. The Overland Summer Writing Program is based on the Williams College campus in Williamstown, Massachusetts. We’ll be in class every morning, writing and revising under the guidance of a master teacher and two Overland leaders. In a supportive setting, students will break writing down into steps: brainstorming, outlining, writing a first draft, reading aloud, editing, revising and producing a finished product. We’ll focus on expository writing, but we’ll have fun with poetry and short stories too. Oxbridge offers Creative Writing and a variety of other programs in several locations, including historical and scholarly centers such as Oxford and Cambridge in England, Montpellier and Paris in France, Salamanca in Spain and New York. Open to students in grades 8 – 12. The Putney School Summer Programs offer students age 14-17 the opportunity for in-depth exploration in the visual arts, performing arts, and creative writing, as well as sustainability through our Farm Program. Our ESOL- Program for International Education for non-native English speakers offers English-language classes and accelerated learning through language immersion. We enroll 135 students in each 3-week session. This program is a one-week, non-residential summer workshop for rising high school sophomores, juniors and seniors to explore the process of creative writing in a non-competitive, non-judgmental environment. Participants have the opportunity to attend small writing and theatre workshops led by faculty and guest writers and theatre artists as well as attend and participate in readings. Classes are limited to 15 students with three faculty leaders per workshop to provide individual attention for each student. Learn more. Sewanee Young Writers Conference is a 2-week program that offers playwriting, fiction, poetry and creative nonfiction are led by writers of significant accomplishment and promise. The New York State Writers Institute in conjunction with Skidmore College is pleased to announce the 16th annual creative writing workshop for high school students. 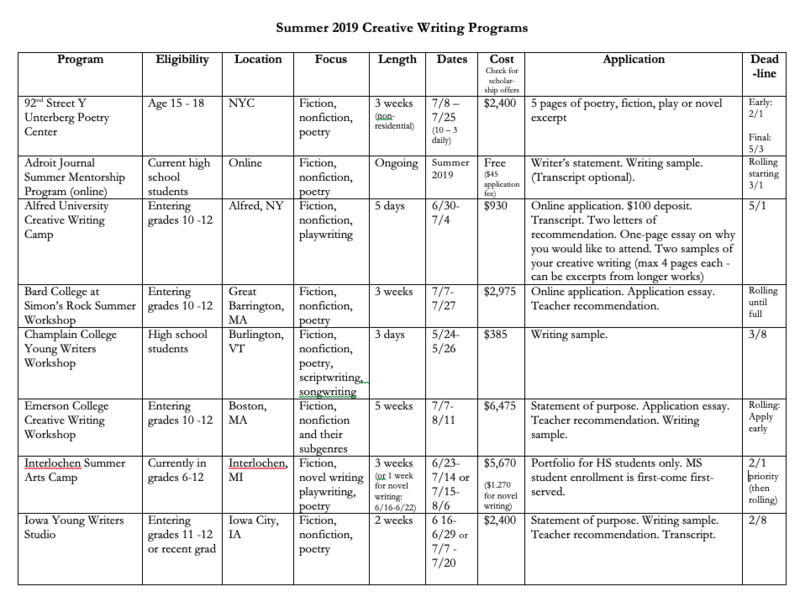 The New York State Summer Young Writers Institute (SYWI) will be held at Skidmore College, Saratoga Springs, New York from July 2 to July 12, 2014. Participants in the Summer Young Writers Institute receive instruction in poetry, prose, and imaginative nonfiction, and engage in the critical evaluation of each other’s work. By bringing top high school student writers together to work extensively with professional writers, the SYWI provides young artists with recognition, respect, opportunities for artistic development, and peer support. The SYWI is open to any high school student entering the 10th, 11th, or 12th grade in the fall of 2014. Approximately 40 students will be chosen, based on the submission of creative writing samples (see application for details). Full and partial scholarships are available to participants based on need. Our summer institute is the first program ever of its kind: An academic camp that invites high school students from all over the country to attend a seven day intensive course that is facilitated by the most successful poetry slam artists in the past decade. Students should expect to leave camp with an initial mastery of both stage and page poetry, their first completed poetry set and product (CD, chapbook, etc), all while belonging to a permanent network of artists who can offer advice and mentorship in the future. The Writers Workshop at Susquehanna University provides some of the nation’s most talented high school writers with the opportunity to work in intensive, small-group workshops headed by nationally recognized authors. The Writers Workshop features workshops in fiction, creative nonfiction and poetry. Class sizes are limited to 15 students to ensure personal attention and individual conferencing. The Summer Writing Program is designed for high school writers who are passionate about their art and want to surround themselves with other like-minded young adults. The rigorous three-week program is an exciting laboratory of ideas, inspiring writers to experiment with language and discover new possibilities for their writing. The workshops in poetry and fiction are supportive environments where writers take risks and refine their skills. Every day, there is ample time to work individually and to meet with faculty one-on-one. 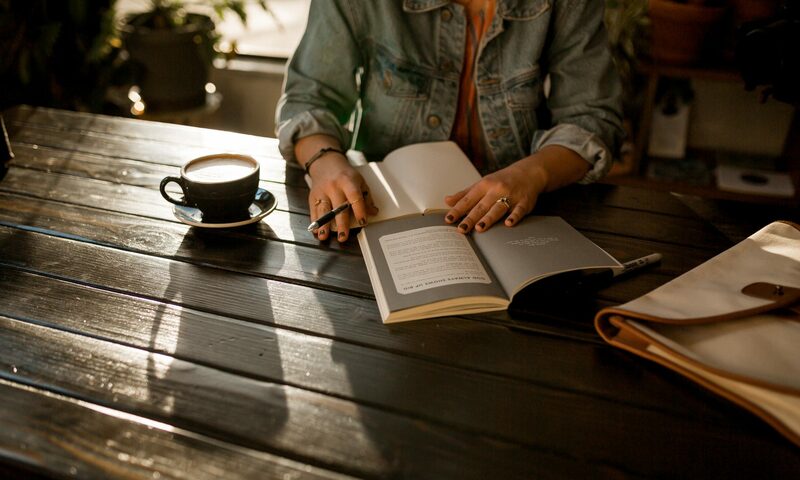 Everyone also participates in collaborative projects with the understanding that a writer grows through a combination of individual work and interactions with other artists. Additionally, published writers will visit campus to teach master classes and give readings of their work throughout the summer session. Young Playwrights Inc.’s Urban Retreat is a nine-day intensive program in playwriting for writers aged 14 to 21. Open by application only, each year young writers from across the United States come to New York City to attend the Retreat. This year’s dates are July 11-19, 2015. Deadline for application: May 1, 2015.